Discover elegant items to ensure optimal performance even under the most complicated conditions, search in Electronics, Computer & Photo. Learn more about the 340-2700 4-way reactive power divider. D/F term. which will surprise you with its convenient features. Check out CommScope, widely used for professional and consumer applications. Active commitment to engineering and technology gave excellent result in this case. Goods that are easy to operate, and follow your intuition - Electronics, Computer & Photo section, that offers: , or and . 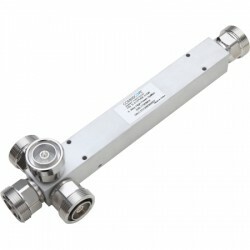 COMMSCOPE 340-2700 MHz four way power splitter. -160dBc PIM rated. 300 watt. IP65 rated. 3dB split loss. 7-16 DIN female terminations. With our captivating items we provide good offers and enjoyable shopping. Purchase any product; we will deliver it promptly, at your convenience. Whether you need an air of sophistication or just practicality, you will appreciate our choice of charming items. Shopping online can remove some of the strain of everyday living. Find a huge variety of similar well designed products bellow. If you have any questions, don't hesitate to contact our Customer Service department, after all, they are here for you. For a large variety and more related products, please visit other sub-categories for anything you need.